The value of pipe #162 is n/a points. I met Tom Colwell at the April, 1999 Chicago pipe show. At that time he sold me a used the pipe and promised to keep an eye out for me for more. Imagine my delight when I attended the August, 1999 NASPC show, and he had saved no fewer than seven pipes for me, 2 black Dublins, a black Billiard, a black Apple, a gold Billiard, a blue Dublin, and a Raspberry Dublin. 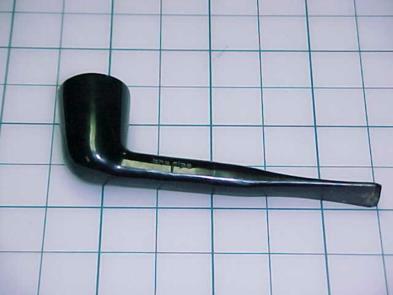 One of the black Dublins went to my Pipes for Sale page. The others were added to the collection. Ron Ward bought this one.